Tool vests provide technicians and hobbyists a comfortable and convenient way to store gear- keeping a variety of tools on hand for easy access (Source). They typically feature strategically placed pockets and adjustable shoulder straps to accommodate different-sized users and bulkier winter clothing (Source). The Stanley Fatmax, Holmes, and Leapers tool vests are lightweight, mesh options. One complaint for the Stanely and Holmes is that when you bend over, tools have a habit of falling out because of the open-pocket design. They are the only two, however, that provide reflective safety strips. The Leapers is really more of a tactical, shooting vest than a technician's vest, but is a highly regarded option with a ton of strategically located, zippered pockets. The Bucket Boss and Dickies Work Gear Apron are canvas tool vests that are more like bib-style aprons than traditional tool vests. They feature chest pockets with a row of compartments around and below the waist, depending on your height, and is often favored by woodworkers. Because they're made from canvas, they're the only two that help provide impact-protection from flying debris. 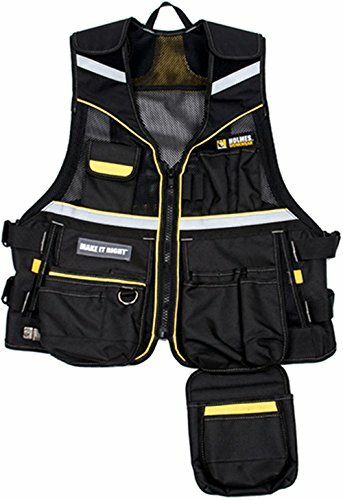 This tool vest offered by Stanley is a solid option for a handyman or an electrician who needs a way to keep his tools close. Users love the handiness of this vest, but do complain about the pocket design. This product features multiple-use compartments for all storage needs. 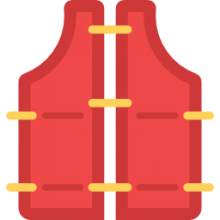 It is made of an air-mesh material that enables the vest to “breathe”. The adjustable shoulder straps allow it to be suitable for different sizes. This tool vest seems like a solid choice if you are looking fora vest with reinforcement for sharp tools and nails. The general user consensus concerning the Stanley tool vest is that it is handy, light-weight and cool. They say it is a great item for holding and organizing tools while working on projects around the house. However, many buyers complain about the design failure due to which things fall out of the pockets when you bend over. Therefore, users recommend placing more Velcro straps over the sections of pockets. One dissatisfied purchaser complains about the neck being very rough, which is why he suggests wearing it with a collared shirt. 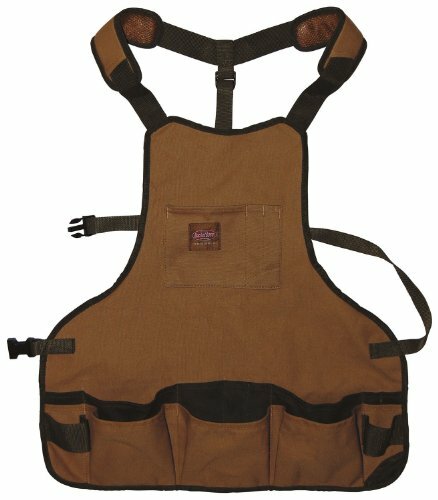 This tool vest offered by Holmes is a solid option if you are looking for a handy piece of work wear. Users like the functionality of this product, but do complain about the quality and the pocket design. This product features multiple tool pockets and pouches for easy organization and access. The mesh back allows airflow for excellent comfort. It has reflective materials on shoulders and a nickel tape measure clip. 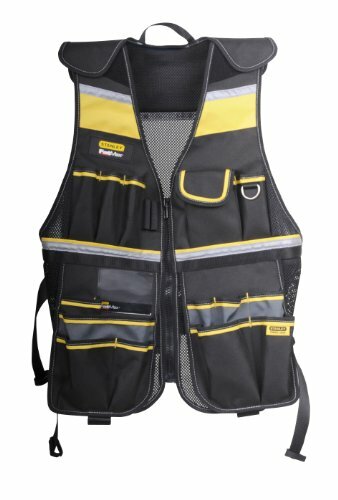 This tool vest might be a solid choice for those who need a work wear with different tool compartments for easy carriage and convenient access to frequently used tools. In general, users have a favorable opinion of the Holmes tool vest.What they praise is that the product is comfortable, handy, adjustable, a great fit, very light and balanced and easy to work with. However, some purchasers complain saying that the product is great in concept but poor in execution. The reasons for this is the poor quality (one dissatisfied buyer says that the zipper was falling off after the first day of use, another one shares that the stitching was not adequate for work wear, while the third states that pockets are too light, pen holder too loose, hammer sleeve too small and too high and that the tape measure clip broke off in first 5 minutes of work). Many users also complain about the pocket design which causes things to fall out when bending over. This tool vest offered by Bucket Boss is a good option for those who need a duck wear apron for working in a shop or garage. Users like the handiness of the work wear apron, but some do complain about the cheap quality. This product is made of 18 oz. duck wear canvas and is suitable for protecting you from flying debris. It features 16 pockets and 2 web loop hammer holders. The quick release adjustable belt fits waists up to 52″. If you are looking fora duck wear apron that will stay up on your torso thanks to suspenders with padded shoulder straps, this might be a good option. In general, users have a favorable opinion of the Bucket Boss duck wear apron and they state that it is perfect for light daily use, easily adjusted and has sensibly-sized pockets. Many buyers share that they like the lighter weight canvas because it is not too stiff. They add that the padded shoulders are a plus making it comfortable to wear even when loaded with tools. However,some purchasers complain about the cheap quality. One dissatisfied purchaser shares that within the first two hours of use the bottom pocket seam came loose and things started falling out. Another online reviewer states that the fourth time he used the vest the seam at the bottom of the pouch ripped, making it useless. If you are looking for a comfortable shooting vest, you might want to consider this one offered by UTG. Users love the quality of this product, but some do complain about the adjustability for shorter men and certain holster issues. This product features a 4 deluxe adjustable rifle mag pouches (3 right, 1 left) with Velcro closures. The heavy duty back loop system allows for carrying additional gear and tools. Other features include two internal zippered map/document pouches and a mesh ventilation system. This tactical scenario vest could be a good choice if you want a high-quality one. In general, buyers have a very positive opinion of the UTG tactical scenario vest. They state that it both looks and feels like a high-quality product. Many of them are satisfied with the construction, stating that the quality is outstanding for the price. One happy buyer says that it is made of a heavy mesh that makes it ideal for wearing over any clothing or outer gear. He adds that there are lots of straps to customize the fit. However, some buyers complain about not enough adjustability for shorter guys. Another repeated complaint regards the holster which isn’t very universal, i.e. it can’t fit any accessories on the gun when having it in the holster. 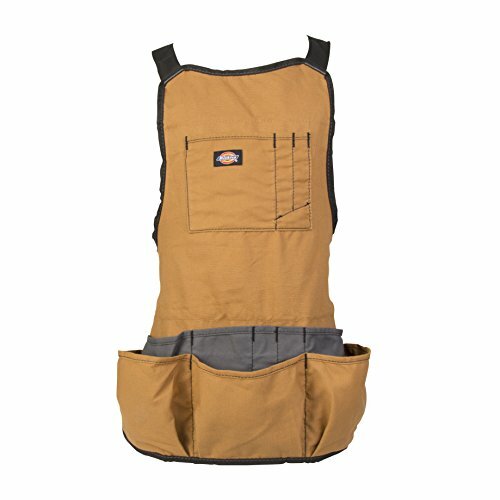 If you are looking for a tool vest, you might want to consider this bib apron offered by Dickies Work Gear. Users like the handiness and quality of this tool vest, but some do complain about several design drawbacks. This product is a 16-pocket bib-style apron which allows you to keep your tools within reach. It is made of heavy duty canvas with webbing-reinforced pockets. 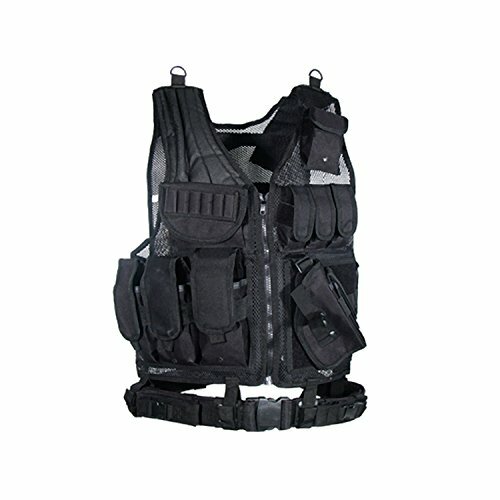 The vest features 3 chest pockets, 13 waist pouches and 2 webbing hammer loops. It is available in two colors, namely black and tan. If you are looking for an inexpensive bib-apron, this might be a solid option. In general, users say that the Dickies Work Gear bib apron is a handy workshop bib made of quality materials. As they share, the construction is durable and designed with many pockets (and loops) for holding several tools. Many of them agree that it is a good value for the cost. However, some purchasers complain of several design flaws. First, it is hard for some to find a proper configuration for the straps in the back that would result in the apron being snug all the time. Second, the pockets have no snaps or closures and therefore,as one online reviewer says, become sawdust collectors. The first multi-pocket tool vest we took a look at is manufactured by Stanley- it's complete with air mesh and reflective safety strips. It's marketed as a comprehensive and convenient men's work vest to keep a variety of different tools from screwdrivers and jab saws to utility blades and tape measures completely accessible while on the job site. Because of the adjusting shoulder straps, you'll be able to find a tight and secure fit, which is helpful for short and tall man alike. As well, this means that during the winter months when you're wearing bulkier clothing outside the tightness adjustment means it can accommodate your warmer weather clothing. There is some mixed feedback for this particular tool vest, with one buyer complaining that whenever he bends over, everything in the pockets falls out. One reviewer compared it to a woodworking apron that he had purchased years ago, saying that he's relatively pleased, though the fabric can be somewhat abrasive around the neck. In terms of the different pockets, buyers, in general, say that they are strategically located and provide a variety of different depths and sizes to accommodate tools like tape measures, rulers, wrenches, writing pads, pencils and combination squares. A carpenter we interviewed told us that while the material is lightweight that if you load up the work vest with have your equipment like pliers and screwdrivers on the front, the back will then slide up which is pretty uncomfortable. The second option we examined was the Holmes Workwear tool vest- like other options it has a variety of tool pockets and pouches designed for convenient and organized access to equipment. Buyers say that smaller tools have a tendency of falling out when you bend over. Buyers have provided mixed feedback with a primary complaint being the quality of the workmanship- many reviewers say the stitching was inadequate. The third pocketed technician vest we examined is the Bucket Boss apron- it's manufactured as a durable, canvas option designed for home or shop work. It's engineered to provide a full frontal coverage protection against flying debris- different than the other multi-pocket work vests we examined that don't provide any sort of impact resistance. One buyer even did some sewing to integrate a Velcro tab into its pockets to ensure that items won't fall out when he bent over, a common complaint we've seen with men's work vests. One woodworker we spoke with tells us that he uses it on a daily basis in his woodshop when he's at the lathe and it's a convenient way to keep his calipers, compass, tape measures and pencils readily within reach. The fourth men's work vest we examined was a tactical vest provided by Leapers. It's actually marketed as a shooting vest with rifle magazine pouches and a cross draw holster with a variety of mesh and zippered pouches. Buyers say it is a high-quality tactical work vest for budget buyers- many say that it is best used for tactical or covert operations. The last electrician tool best we took a look at is the Dickies 16 pocket bib apron- it is a canvas designed option that features 2 hammer loops, 13 pouches and three chest pockets with 2-inch adjustable shoulder straps. It's marketed towards carpenters, DIY builders, painters and home hobbyists that need a pocketed working vest. One plumber we interviewed told us that he has worn it on a variety of job sites, saying that as an engineer it's a durable option that holds a lot of different items.